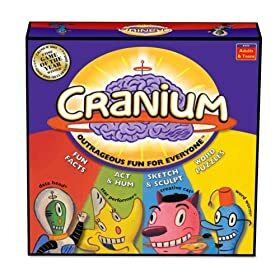 The Cranium game is a fun-filled family game, sure to delight everyone in your group of friends or relatives. As few as four players can participate and the game gets really fun with large groups! Cranium has spawned an industry, with seemingly dozens of spin-off games and activities. It’s a great family game, especially when you have a larger group to entertain. Unlike many other games, Cranium has categories that appeal to a variety of playing styles. Those that enjoy creative activities such as drawing, sculpting, acting, singing, or gestures can play alongside those that like word games, logic, and trivia. No more fights over Trivial Pursuit versus Guesstures! Most activities are easy enough for younger players to enjoy and games can be short enough to hold kids’ attention span easily.Setup is simple and takes only moments. Players move along the board based on how well they do on activities. Colored spaces indicate which category players will participate in and several spaces allow players to choose. The game ends when a team makes it into the center of the board and successfully completes one of each of the four types of activities. The Cranium game is easy to set up and play and has activities that will delight game players of all ages and preferences. I give it five footprints! As it stands, there is a significant issue that was raised in a recent heated battle of the board game cranium. This may be a major flaw in the design of this Canadian-born board game. For the STAR PERFORMER (GREEN) game called CAMEO which, like charades, has one individual act out a word or phrase to their team under a time limit: Is the individual allowed to use a prop (e.g., chip bowl and dip..to describe the activity of double dipping). Thank you to anyone for their help in this dispute.